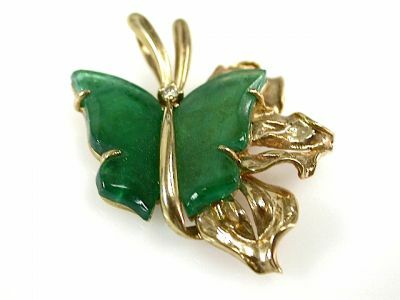 A beautiful custom made vintage 14kt yellow gold butterfly brooch, with 2 claw-set half wing cut deep bluish green emeralds, approx. 19.11 x 9.3 x 1.4mm and 1 claw-set round brilliant cut diamond, est. 0.03ct. (clarity:SI1 & I-J colour).